Full Tilt Poker are the pioneers of the new “Fast Poker” type of game called Rush Poker, the latest craze in the poker world. 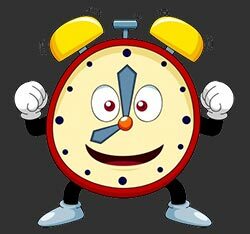 The whole purpose of Rush Poker is to minimise the wait between each hand you play, meaning you will see a lot more hands in a hour than you would during a normal poker game. What is Rush Poker: How Does it Work? In a normal poker game if you fold your cards you then have to sit and watch your opponents play out the rest of the hand before starting the next hand. The concept behind Rush Poker is that as soon as you fold your hand you are no longer active at the current table and are “rushed” off to a new table to immediately start a new hand against a new set of opponents. Instead of playing against a single table of opponents you are playing against a large pool of mobile opponents. This means you will face different opponents every hand, which, if you are a player who likes to study the way people play at a table before making any moves, this format may not be suited to you. You can even shorten the time between hands by using the Quick Fold button before it is your turn to act to quickly move away on to another table and the next hand without waiting. This means you are always in the action, can play an incredible number of hands compared to the normal version of poker and have a lot of fun. How Can I Play Rush Poker? 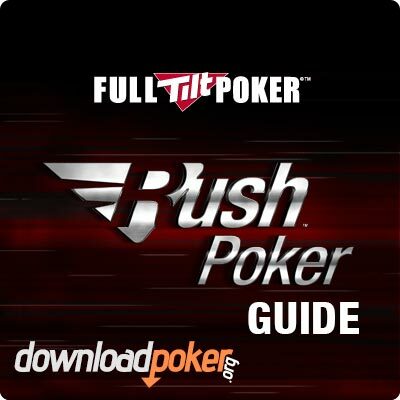 Rush Poker can be played in both cash game or tournament formats. You will need to ensure you have the Full Tilt Poker Software installed. First choose Rush Poker in the first set of options at the bottom of the list. In the second set of options choose the type of poker game you wish to play. Then in the last two sets of options choose the type of betting limit and the stakes you wish to play from Micro stakes all the way up to the highest available stakes. You can choose as many of these as you like to widen the range of tables that will be presented to you. You also need to ensure you have chosen the real money check box at the top right hand corner of the lobby. When you have found the game of your choice then double click on the table in the lobby to enter the game and select “Join Now” to join in and start playing. If you use the Basic View lobby then the steps are very similar to the instructions above. The main difference with the basic view is you can target the specific stake level that you wish to play unlike the standard view which gives you a range of stakes like “Low”. Please note that Rush Poker is not available in the Classic lobby view and to play you will need to change the view to either Basic or Standard View. To change this open up the Lobby Menu at the top of the main screen and highlight Choose Lobby View. Although Rush Poker is a innovative way to speed up the waiting time between hands, the way you actually play each hand is no different to normal. The actions available to you are exactly the same and you take the same decisions as you would normally. It does present a different set of challenges though and you do need to change your approach to the game and strategy in order to come out with a profit. How do the Blinds Work? A big question asked by many players is “How do the blinds work if you are constantly being moved from table to table?” To select who’s turn it is to post a blind, the software calculates which player at the table has gone the longest with out posting a blind. If there is more than one player on the same time then the big blind is chosen randomly between these players. This only works for the big blind as the small blind and all other seating positions are completely random. Due to the format of Rush Poker, your opponents will be folding most of their marginal and low quality hands. This means that you have to tighten up your game also and look to only play premium hands. Premium Hands such as A-A, K-K, Q-Q are hands you are looking for and should be played confidently. Drawing premium hands such as A-K and A-Q and middle pairs such as J-J, 10-10 and 9-9 should be played but with caution. Just bear in mind that you be faced with the high premium pairs more often that usual from your opponents. 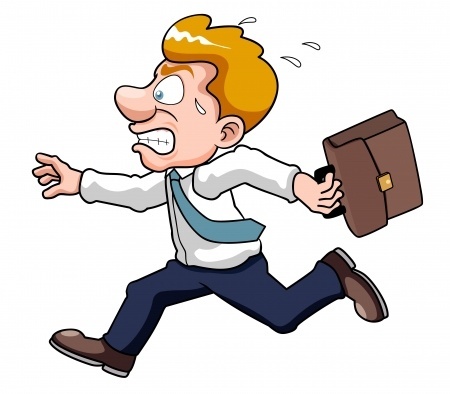 All other hands are marginal hands which you should be extremely cautious about getting involved with. Another thing to remember is that even if you make a strong hand on the flop / turn / river always be aware of the increased risk of someone holding a better hand simply due to the fact that your opponents are playing with better cards than normal in Rush Poker. Making a raise to steal the blinds whilst you are sat on the Button can be a very profitable play in Rush Poker, simply for the fact that a lot of players are very eager to fold in this format, and sometimes won’t even pay attention to the position they are in. This will have a higher success rate than in a normal game and even if sometimes you are re-raised and have to fold, you should take the pot more times than not and make a profit. Related to this also, is the fact that it is really not worth defending your own blind in the reverse of this situation. In a normal game when you are playing against the same opponents for a period of time, it can be sometimes necessary to demonstrate that they can’t push you around and constantly steal your blinds. However when you are playing against a mobile set of opponents this “show of strength” is futile. The Full Tilt Poker software has a built in feature that allows you to take notes on each of your opponents individually by right clicking on their avatar. These notes can then be accessed if you play against the player another time. Now you might ask, what is the point in taking notes on opponents if I am going to be playing against new opponents in the next hand? The thing to remember is you are playing against a pool of opponents, and although your opponents will change each hand, they will always be selected from the same pool and you will play against the same opponent multiple times during a session. If you don’t take notes, then chances are you won’t remember over the fuzz of all the players your brain is processing, so if you spot a trait that could help you in a future hand, then note it down. It is possible to multi table with Rush Poker but this is really not recommended unless you are a experienced multi table player. Rush Poker by design is a very fast paced and frantic game and just playing one table will keep you more than occupied, let alone trying to play at two or more tables at the same time. You are bound to make poor decisions under that sort of pressure, so just stick to a single game. Full Tilt Points are awarded to Rush Poker players in exactly the same way as if you were playing a standard game. If you quick fold a hand and are taken to another table before the hand has finished, the points gained from the table you have just folded from will be awarded in the same way once that particular hand has finished. The Happy Hour also applies awarding double or triple points so this is a very good way of raking up your Full Tilt points, especially if you have a Full Tilt bonus to clear. Some people love the idea of Rush Poker, others prefer normal poker. If you like the sound of it, then it’s worth giving it a go. 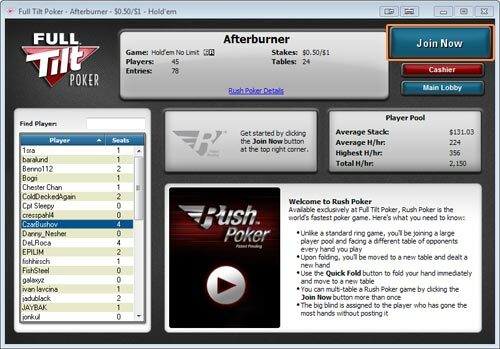 Want to try the new craze that is Rush Poker?